Michael Goldberg has been traveling the country, visiting alternative schools, and writing about them. He recently spent a week and a half in Austin and kindly agreed to share his impressions with us. You can read more about Michael’s alt ed adventures on his blog. Michael Goldberg navigates Austin feet first on Lady Bird Lake. From February 2 to February 11, 2015, I visited eight alternative schools in the Austin area. Seeing those schools was part of a larger project of exploring alternative education that I began in September. Last school year I worked at a charter school in Chicago. While I learned a lot during that year, I was also disillusioned by much of what I saw—particularly by how my school’s near-total focus on raising standardized test scores distracted from students’ developmental needs and did little to foster students’ intrinsic motivation to learn. I felt that there must be a better way to educate, so I started looking into alternative approaches. I decided that I would travel the country on a mission to learn as much as possible about alternative education. I have a blog where I’ve written about some of my experiences. At Clearview Sudbury School, I sat in on a Judicial Committee meeting. Judicial Committee is a democratic, participatory way of holding people accountable for behavior. Students or staff may fill out “complaint forms” against anyone whom they perceive to be disrespectful or breaking the rules, then J.C. (made up of students and staff) investigates the claims and votes on an appropriate response. The J.C. process strikes me as an excellent example of restorative justice. At Whole Life Learning Center, I took part in “rhythm gym” class. We danced, juggled, and skipped to music in a circle. Later I learned about one class’s efforts to make a film about climate change and the environment for SXSW’s short film festival. 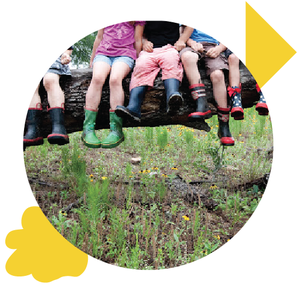 I learned about Radical Roots Community Schoolhouse’s noncoercive, play-based curriculum, as well as its focus on sustainability and appreciation of nature. I helped smash acorns into acorn flour at Greenbriar School, then sat in on geography class, and finally joined the community for a potluck dinner. I was immersed in the alternate reality that is Game of Village at Austin Ecoschool. Game of Village involves students taking on a specific role in an imagined community—the “village”—applying for a “bank loan,” building a model home, and putting on an end-of-the-year fair, among other things. At the Inside Outside School I sang along during morning circle. Later, kids learned how to smoke meat over a fire during outdoor survival class. I attended the Austin Alternative School Fair, where I met a lot of great people working in alternative education. I learned about Skybridge Academy's democratic process for choosing classes. This school seems to be on the cutting edge of offering the intellectual freedom of a college-like experience to students in middle school and high school. Lastly, I saw kids busy at independent work at Parkside Community School. And there are still many more alternative schools in Austin that I unfortunately did not manage to visit. One common thread of the schools I’ve visited, and of alt ed more broadly, is that students are not approached as being primarily minds, intellects, test-takers, or grade-earners, but rather as whole human beings whose experiences, desires, and intrinsic motivations are acknowledged and valued. That is not to say that the adults in traditional schools do not or cannot approach their students in the same holistic way, but I do believe that the policies and educational structures of many traditional schools make taking that approach more difficult to realize in practice. So what makes Austin such fertile ground for alternative schools? I imagine it’s not unrelated to the goal of “keeping Austin weird.” Progressive parenting styles likely also contribute. Perhaps Austinites are just willing to try things differently. I believe that alt ed in Austin, like alt ed throughout the country, has its reasons to celebrate and its challenges to face. Alternative education seems to be growing—as more people realize that their values and approaches to parenting may not align with the practices of many traditional schools. We should celebrate the fact that people are waking up to this, that they’re feeling comfortable to question the assumptions many of us hold about education and to actively seek out and construct alternatives. And we should celebrate that many kids are experiencing formal education in holistic and liberating ways. At the same time, alt ed is not without significant challenges. The most pressing and most important of these, I believe, both in Austin and in the country at large, is to make private alternative schools more accessible and inclusive. It’s important to keep in mind that there are many families who do not have easy access to educational alternatives. Addressing this will not be an easy task, and it will not be confined only to factors within the immediate control of alternative schools. Nonetheless, alternative schools should do everything within their power to make the education they offer as accessible and inclusive as possible. I don’t believe that there is a single approach that works for everyone. Individuals, families, and communities should each be empowered in educational decision-making. The alternative education movement—if there can be said to be such a thing—is largely about offering such freedom of choice. And although there is work to be done to ensure educational quality and genuine freedom of choice for all families, it’s exciting to see Austin offering so many options.